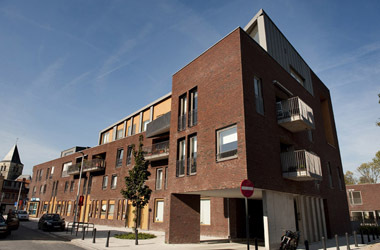 The site of a former hospital was transformed into a new housing district with 74 houses and apartments. 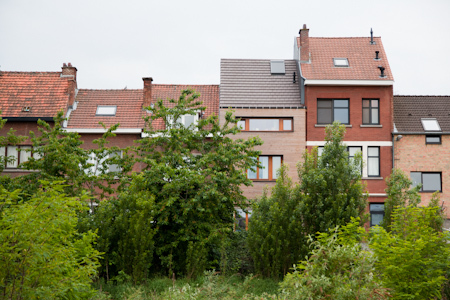 With its broad range of different typologies, this project offers home buyers an architectural alternative to the uninspired projects which flood the Flemish housing market. Close to the town center the urban tissue is dens, here we find the new apartment building. Closer to the outskirts the tissue becomes more open. In the middle a small park where five small apartment buildings sit between some very old and very impressive trees. By restoring a small brook, the three areas a linked. Strolling along the brook, pedestrians discover some pools and a children's playground. Renovation of a single family dwelling in Leuven, Belgium. By lifting the roof, the attic is transformed into two spacious bedrooms with mezzanines. The facades received a new wooden skin. The entire project is environmentally friendly. Energy consumption is thorougly reduced by insulating the exterior skin. The roof is fitted with solar panels, both thermal and photovoltaic . Only natural and environmental friendly materials were used. The site of the Saint-Luc Hospital in Woluwe lacks parking capacity resulting in traffic jams, parking violations and missed doctor’s appointments. To resolve these problems, the existing parking esplanade was extended, doubling in size and capacity. The parking has two underground levels and an outside parking area. 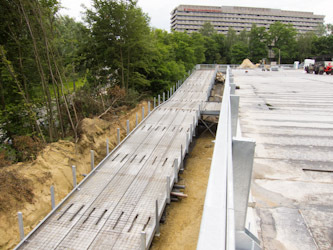 Two outdated entrances were replaced by a new spacious entrance and two superimposed ramps. Visitors are welcomed by a brand new parking lounge which houses a counter, ticket machines and a new elevator. The new extension is situated next to a protected ‘natura 2000’ site. A special effort was made to protect the wildlife. The parking’s water management system helps to prevent flooding in the downstream parts of the natural park. Special LED-lighting was used to reduce light pollution and to protect migration bats. This bank office is situated at the ground floor of the Brouckère Tower, at the heart of Brussels. 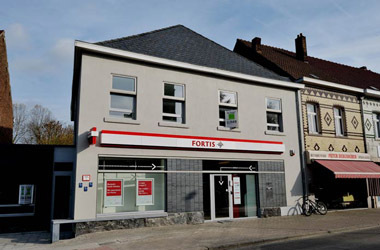 Often very crowded, this is Belgium's largest bank branch. The outdated front façade was replaced by a large glass wall, making the office very transparent. At daytime the bank is flooded with light, during the night the large display windows becomes a beacon. 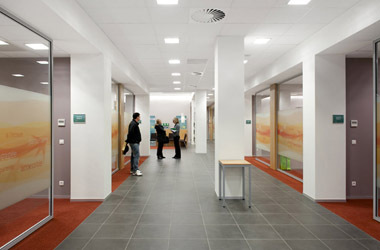 Inside customers are welcomed by a completely new interior with warm colors and materials. Some strategic architectural interventions add an extra touch to the bank's corporate house style. Large interior windows add extra transparency. At the heart of the office sits a waiting area with an extra high ceiling, flooded in light. 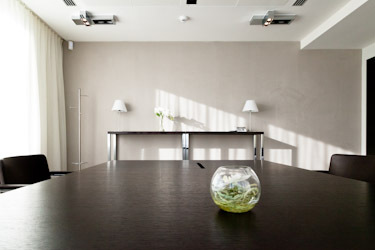 This private banking branch is situated in Waterloo, close to Brussels. The outdated existing offices were transformed in a modern meeting point with a sophisticated look and feel. Luxurious materials and furniture were combined with a pure and minimalist design. The private banking branch has the appearance of a sophisticated parlour while maintaining the functionality of a modern banking office. A lot of attention went to the discrete integration of the technical equipment. Thanks to planning and rigorous on site coordination ventilation, air-conditioning, domotics, a sophisticated lighting system, audiovisual equipment and a data network were seamlessly integrated, without compromise. Dworp is a small picturesque town close to Brussels. At the central square, opposite the church, a 250 year old building was transformed into a modern bank office. Due to its age and to some improvised former renovations, the structure was in a very bad shape. An extensive renovation was needed to restore the building in its former glory. After reinforcing the foundations, the inside was stripped, replacing all the floors between the basement and the attic. The outdate façades were thoroughly renovated as well. 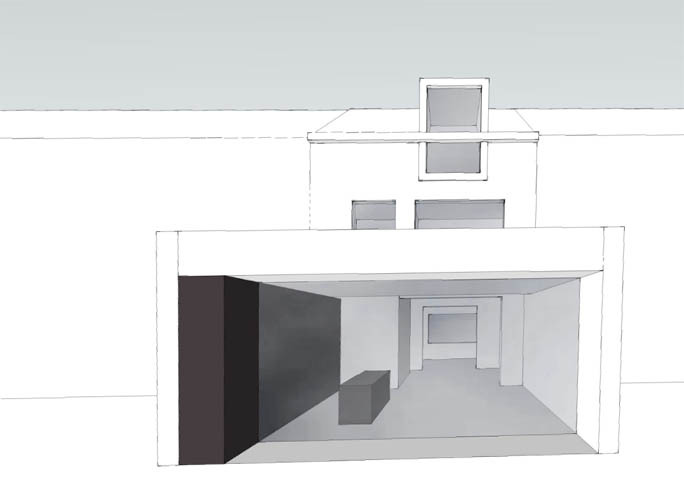 The first floor was transformed in a spacious apartment with a direct link to the garden. FESTO specializes in factory and process automation. The German company has over 300.000 customers in more than 200 industries worldwide. The offices of FESTO Belgium are located in Schaarbeek, Brussels. During the first phase of the renovation, an outdated storage area was transformed into a new work shop. Despite its location in the basement, the workshop is flooded with natural light. 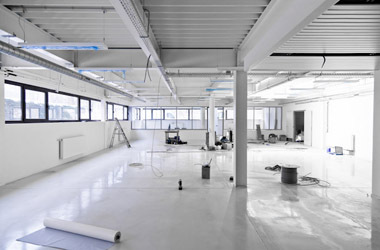 During the upcoming second phase the offices will be completely renovated as well. When the project is finished, the building will once again reflect the company’s high tech house style. The small dark kitchen was replaced by a new spacious extension. Natural daylight enters freely through the large sliding windows.